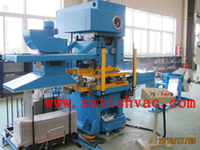 Size And Ring Machine is important machine for heat exchange Coil production. 2.1 Size And Ring Machine Format of structure:This is multi-function Size And Ring Machine with rotary table, It is available for Return Bender Leg straightening, Return Bender End rounding, End burr cleaning, Ring Loading, and foreign matter inspection in the copper tubing legs. Whole machine is consist of Ring & Return benders Loading system, Ring Loading System and electric control system. 2.2 Size And Ring Machine's system as machine materials Feeding system is composed of U Bend rotating-feeder, welding ring feeder and feeding paths. Put the return bender and welding rings into return bender feeder and welding ring feeder respectively through manual operation, then automatically enter into the position of ringer along the material path. 2.3 Ring Loading System Turning table driven by motor works in intermission action for achieving feeding, Rounding, Ring Loading and inspection respectively. 1. Equipment use PLC controller OMRON. 2. Pneumatic parts use high quality products, import brands SMC products. 3. For main electric components (limit switch, switch button, air switch, contactor, relay, thermal relay) use high quality components. The brand of SCHNEIDER, OMRON. Please contact us if you want more details Size and Ring Machine or Auto Ring Loading Machine Thanks again for your interesting in our Size And Ring Machine. Looking for ideal Ring Loading Machine Manufacturer & supplier ? We have a wide selection at great prices to help you get creative. All the Size And Ring Machine are quality guaranteed. We are China Origin Factory of Auto Ring Loading Machine. If you have any question, please feel free to contact us.